Commentary by Dr. Tom Borelli originally posted at Conservative Review. The decision by NFL Commissioner Roger Goodell to strike a balance between football players’ desire to protest during the national anthem and outraged fans is foolish and outright dangerous. The shocking lack of leadership from Goodell is destroying the NFL brand and the acceptance of anti-police Black Lives Matter propaganda by the league will endanger law enforcement. The focus of the controversy surrounds player protests and fan backlash but precious little time is being dedicated to the consequences of the NFL supporting the false narrative that police are targeting blacks. Following the Fall League Meeting with a group of team owners, players and union officials, Goodell said the league wants players to stand but the league would not force players to do so. It’s apparent Goodell recognizes the importance of players standing for the national anthem but he is bowing to the will of a small group of protesting players that he estimated to be about “a half dozen,” to hijack the entire league. Goodell wants to work with players to advance their social activism, but cloaking actions in the socially acceptable term of social justice avoids the reality that the protest movement is based on Black Lives Matter misinformation ignited by former San Francisco quarterback Colin Kaepernick. The unsigned quarterback also wore anti-police socks depicting pigs wearing a police uniform during 2016 training camp. The anti-police narrative of Kaepernick was recently carried forward by star defensive lineman Michael Bennett, who claimed he was detained by Las Vegas police following an incident at a hotel because he is black. Unable to defuse the controversy, the NFL is facing significant backlash from fans which is negatively impacting the league.TV ratings are down almost 8 percent during the first six weeks of the season this year compared to the same time period in 2015. Concerns about the rating drop in NFL games prompted a stock market analyst at Credit Suisse to reduce estimated earnings for CBS and Twentieth Century Fox. Damaging photos of huge blocks of empty seats at NFL stadiums spreading on social media are being tied by some to the player protest. The financial damage done to the NFL is a private business decision by the league and its team owners.However, the adverse social consequence of the NFL promoting the Black Lives Matter political agenda is extremely dangerous to law enforcement. Black Lives Matter gained national attention following the 2014 shooting death of Michael Brown — a black teen — by a white police officer in Ferguson, Mo. The police officer was found not guilty of a crime, but the false claim he shot Brown with his hands up generated the “Hands up, don’t shoot” rally cry that became a useful propaganda tool of Black Lives Matter protesters. The “Hands up, don’t shoot” lie spread throughout the country, including high-profile examples of St. Louis Rams NFL players running on the field and representatives on the House floor holding their hands up in the air. Media saturation of the Black Lives Matter cause twisted minds leading to the killing of police. The black man that killed five police officers in Dallas, Texas, told negotiators that “he was upset about Black Lives Matter,” before he was killed. Following Ferguson and other Black Lives Matter protests, the number of police killed in ambushes rose dramatically. According to the FBI, 17 law enforcement officers died in ambushes in 2016, representing 25 percent of those killed from criminal activity (the five slain Dallas police officers were included in the 2016 FBI report). Most important, crime statistics do not support the claims of Black Lives Matter or NFL protesters. Heather Mac Donald from the Manhattan Institute exposed the false narrative propagated by Black Lives Matter that law enforcement targets blacks. In a recent analysis, she cites four studies that refute black shootings by police are racially motivated. 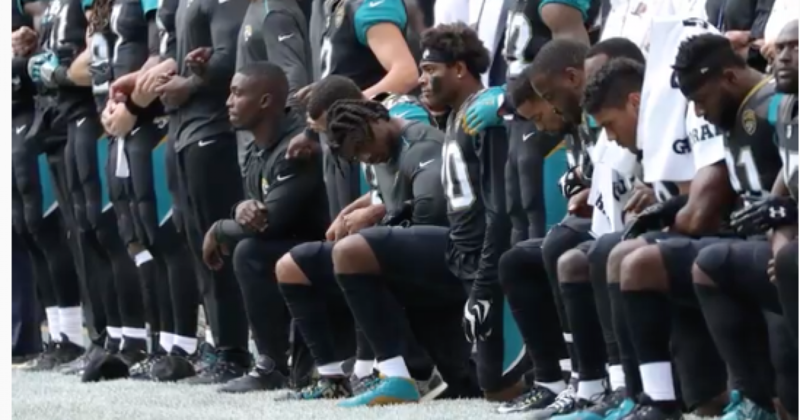 The NFL is missing a teachable moment about blacks and law enforcement and its decision to become a vehicle for propaganda could cost more blue lives.